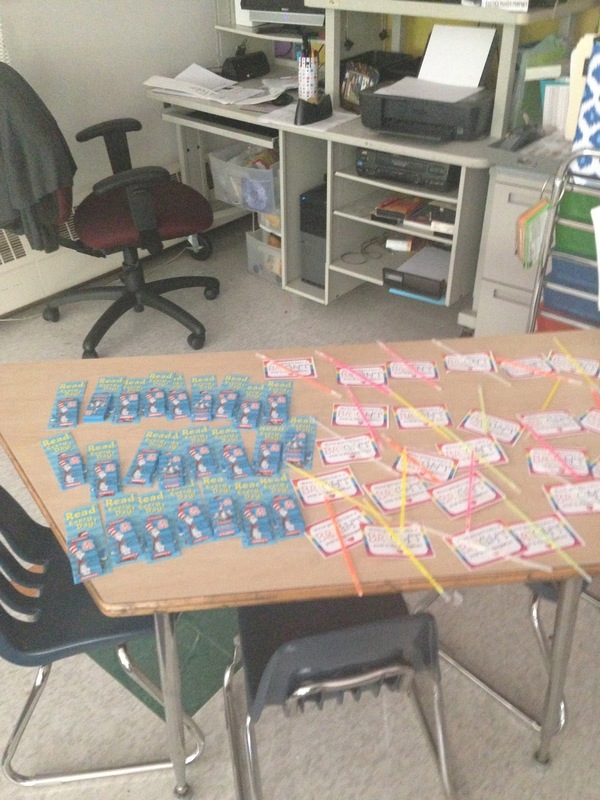 Classroom Ready...and a few freebies! My school adopted a new reading program and I've been trying my very best to make sure I am ready and organized in order to do my very best this year. So I've got tons of pictures and freebies to share. I'm also working on my Pacing Guide for this year. It will be available very soon. 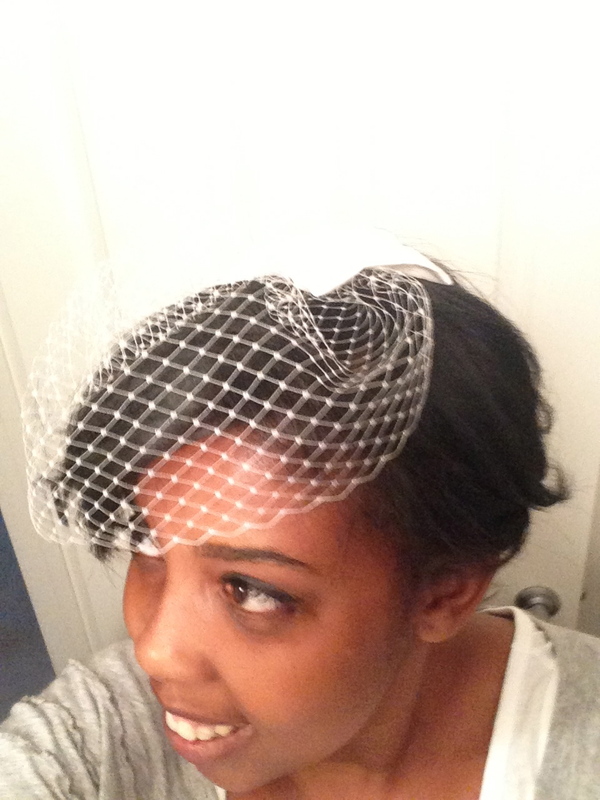 But first...here's a little taste of some of my wedding news. In 99 days I will be a MRS.! WHAT!! You can't even see the best part of it...I'm so in love!! So here's my classroom. I'll start with first steps into my room. This is the door to my room. 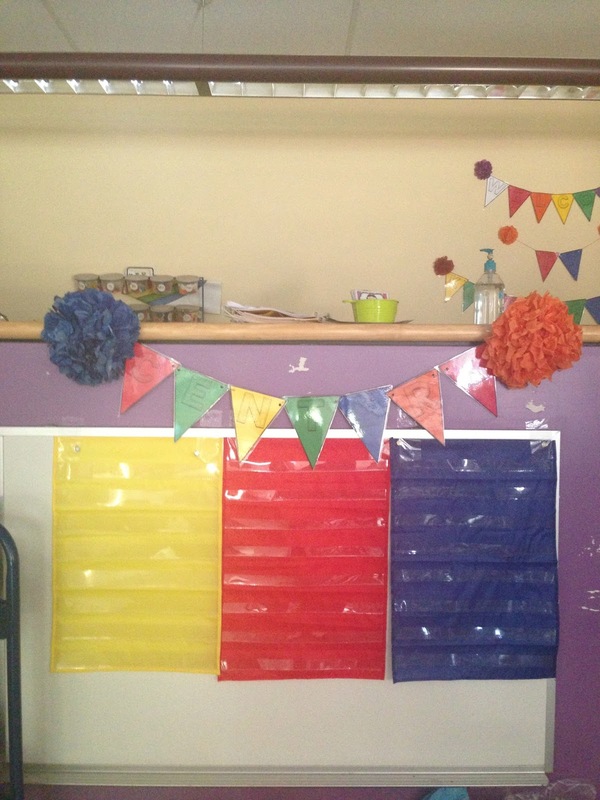 I used butcher paper and crumbled it up into long strips to make a rainbow. 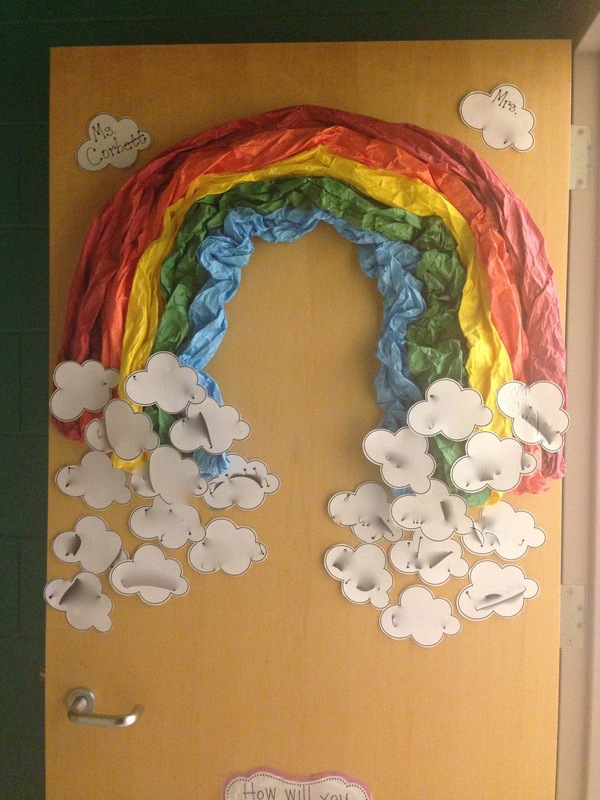 I wrote my little ones names on clouds and taped them onto the rainbow. I have 23 kids this year! Underneath, I kept my How will you start the day? poster up. Kids choose a hug, handshake, high five, or hollywood kiss. Here's the link for that freebie. This the view as soon as you step into the room. Kids will drop their lunches in the bucket on the right. Straight ahead are the coat cubbies. 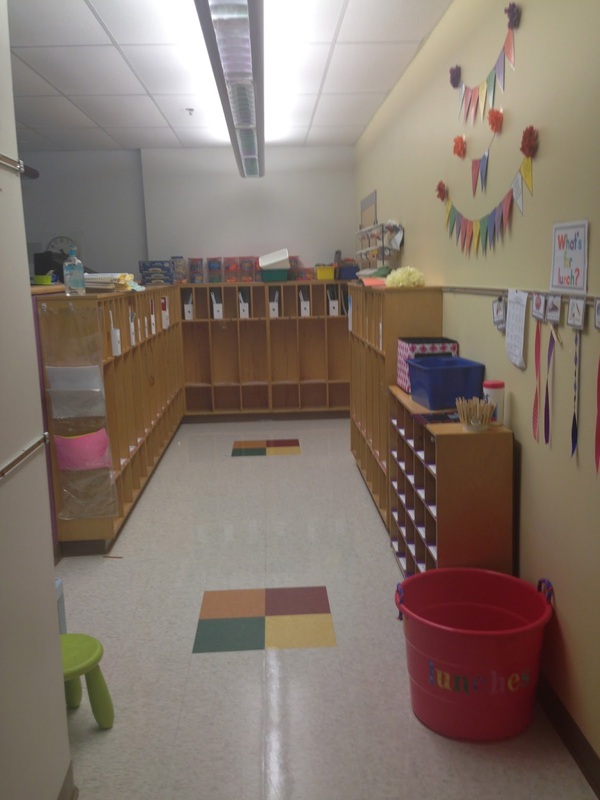 Kids place their backpacks and coats in these cubbies. The cubbies to the right are for papers that need to go home. Here are a few more close up pictures of the wall on the right. This is how kids will mark their choices for lunch each day. On top of the cubbies are some clothespins. Kids mark their choice and I record it on our daily lunch sheet. If you'd like the sign, "What's for Lunch? ", click here. 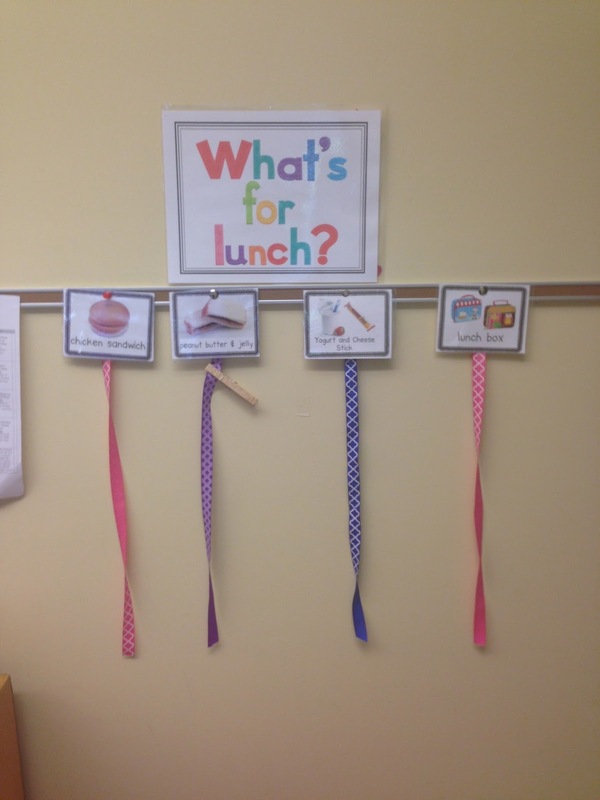 The pictures for the lunch choices were from TpT. 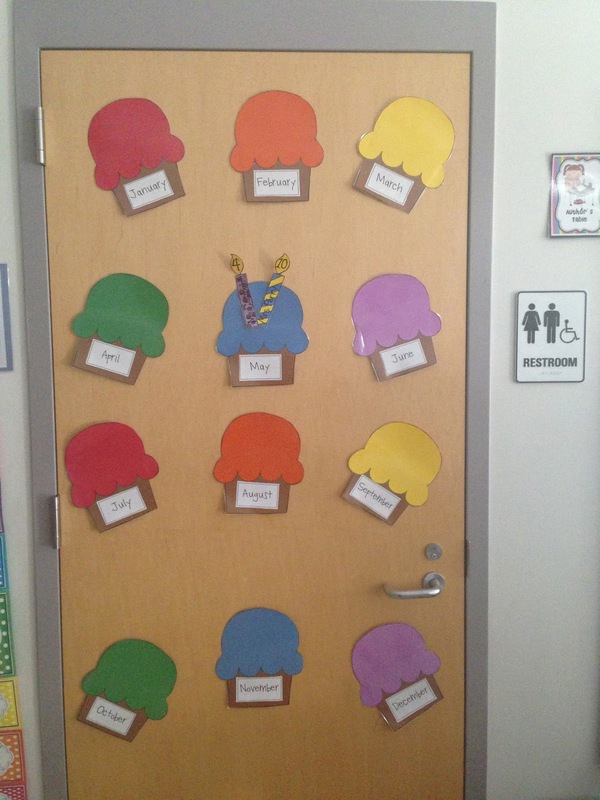 The sign says, Welcome to Kindergarten. More on the pennant signs later. Here's a close up of the kids coat cubbies. In the book boxes (which I found at IKEA for super cheap) are the journals and folders the kiddos will need for the year. 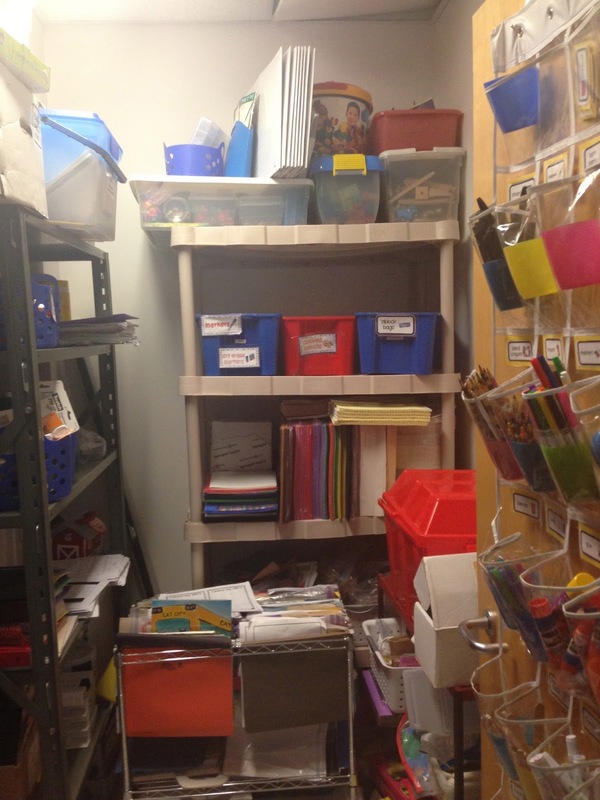 These are pics of my supply closet (I know I died last year when I found out I had a closet!) There's tons of stuff in there but it works. When the door to the supply closet is closed...this is hanging on the door. This is for the kiddos to use throughout the day. They mostly use the supplies when they are at the creation station (art center) but it holds extra scissors, glue sticks and other daily used supplies. Here's a close up shot. 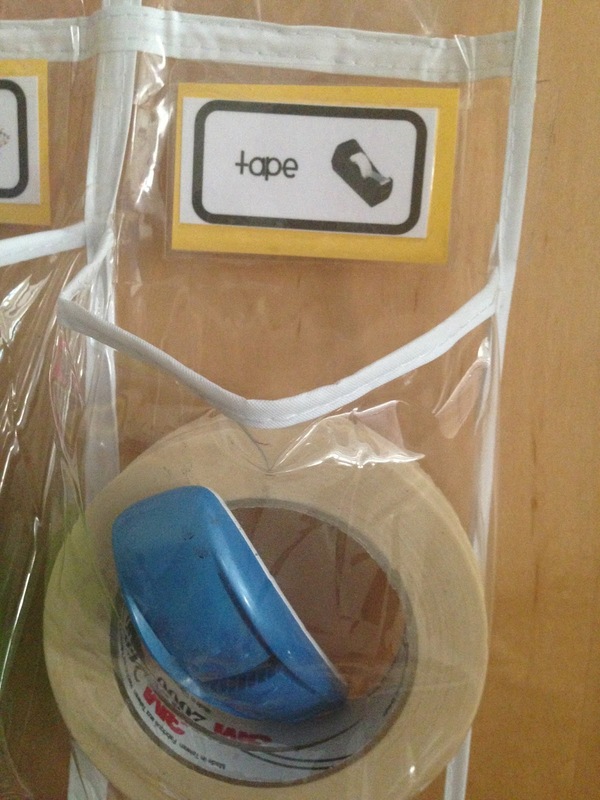 I found the labels on TpT. This is the door to the bathroom. I decided to use it as our birthday door as well. I hope it stays nice and neat...and germ free all year. On each cupcake is a candle for each child's birthday. Here's how I made each candle. I drew some rectangles then covered them with washi tape. Then, I drew some flames (this is where I'll place the number date of each kiddos' birthday). 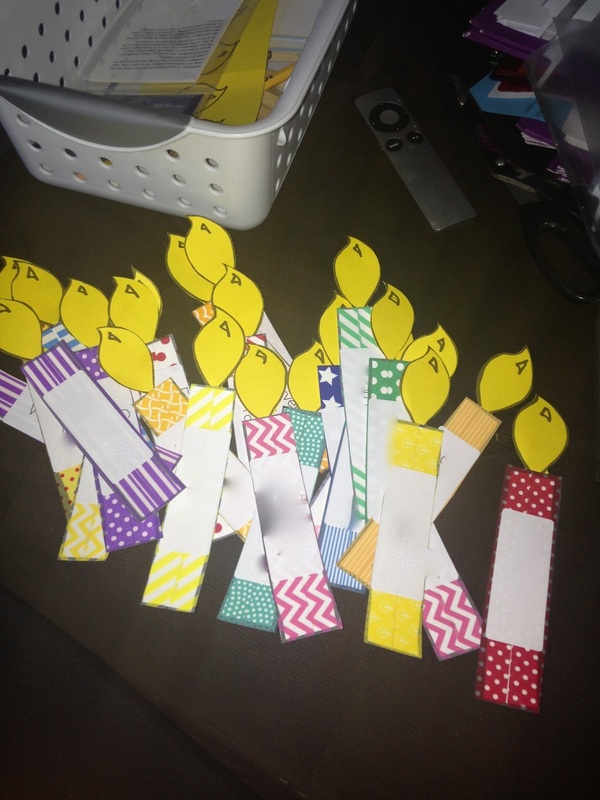 On each candle is a label of each kiddos' name. This is my center chart. After reading Jan Richardson's book this summer, I decided to try a new way to post my centers. I needed a few more pocket charts in order to make it work. The pennant says centers...more on those later. This is my writing center. The sign says, "Writer's Wall". 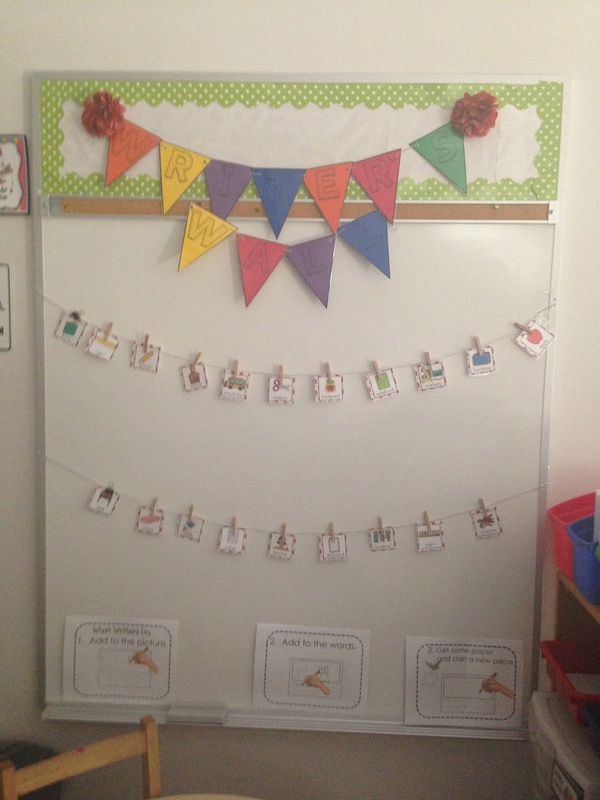 I took a cue from Mrs. Wills and posted my monthly/theme vocabulary words on a string with clothespins. They will be changed out as our units change. 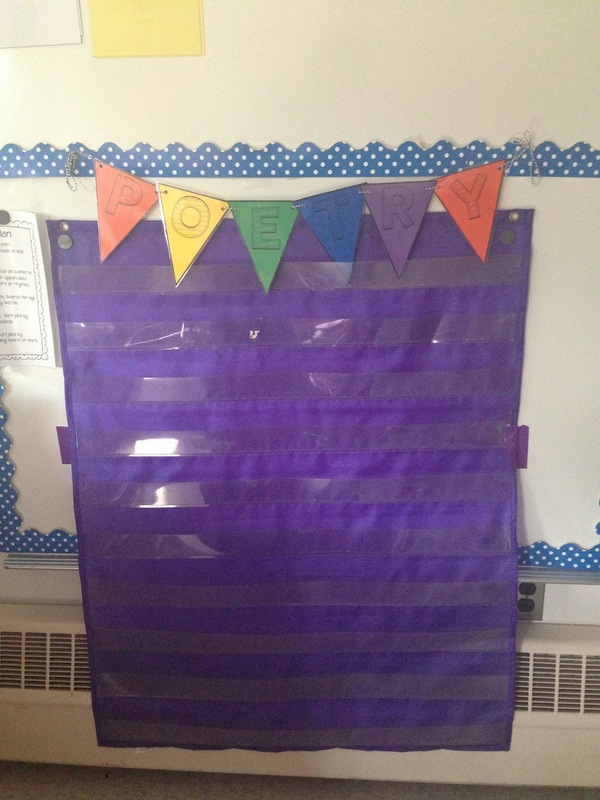 I have Back to School words posted. This is another part of the writing center. It's hard to see...but on top are various activities for kids to choose from. I also have writing tools available on the top shelf. 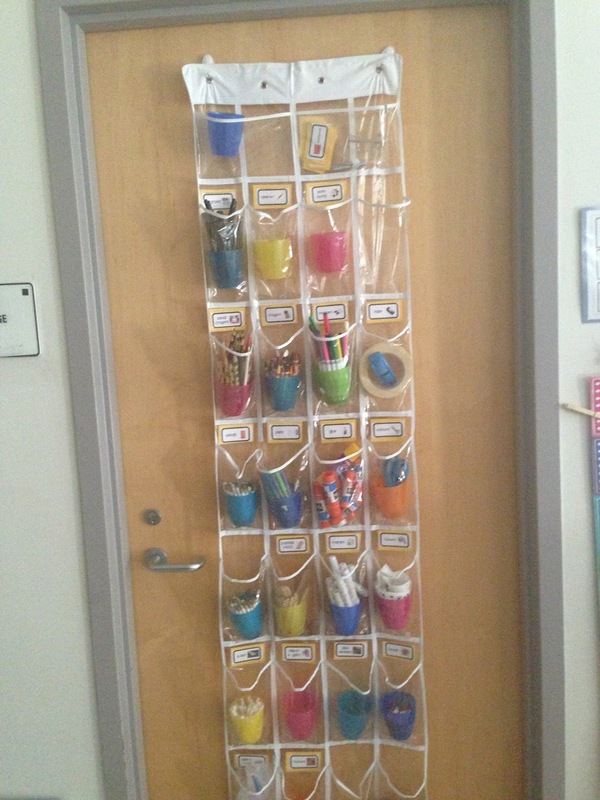 The next shelf holds different kinds of paper for the kiddos to choose from. 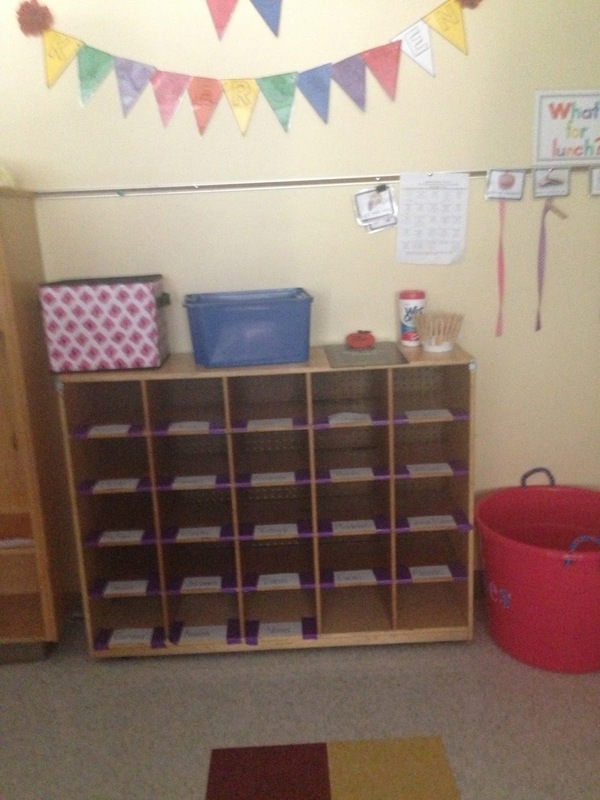 The second shelf has an organizer bin that holds envelopes, index cards and post-it notes. 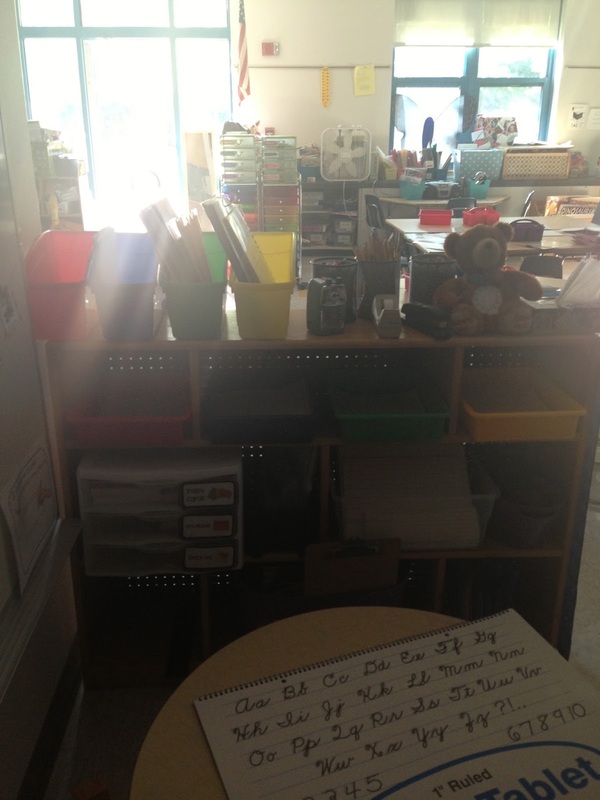 This row also has our class set of dry erase boards and makers. 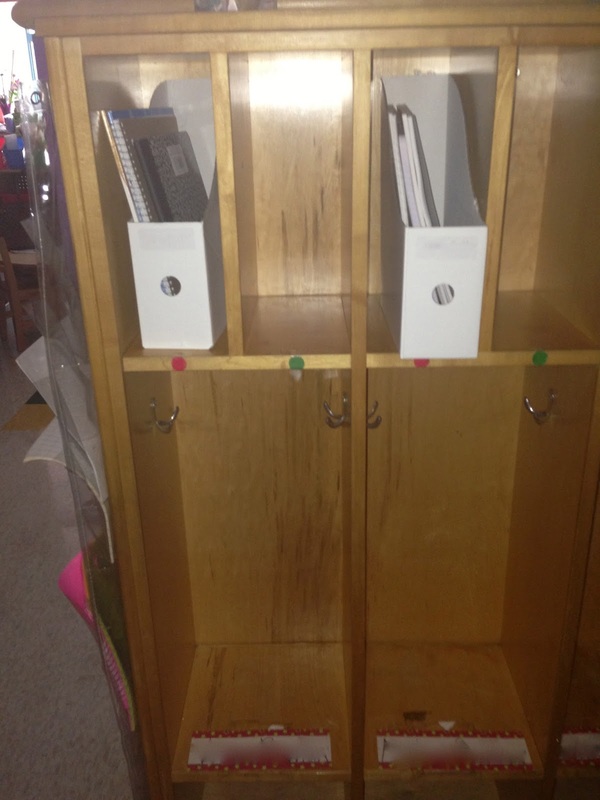 The last shelf has our classroom clipboards. This is the back of the writing center shelf. It's my science wall. The pennant says, "science". More on those later. On the left, are the steps of the scientific method. This is my area. 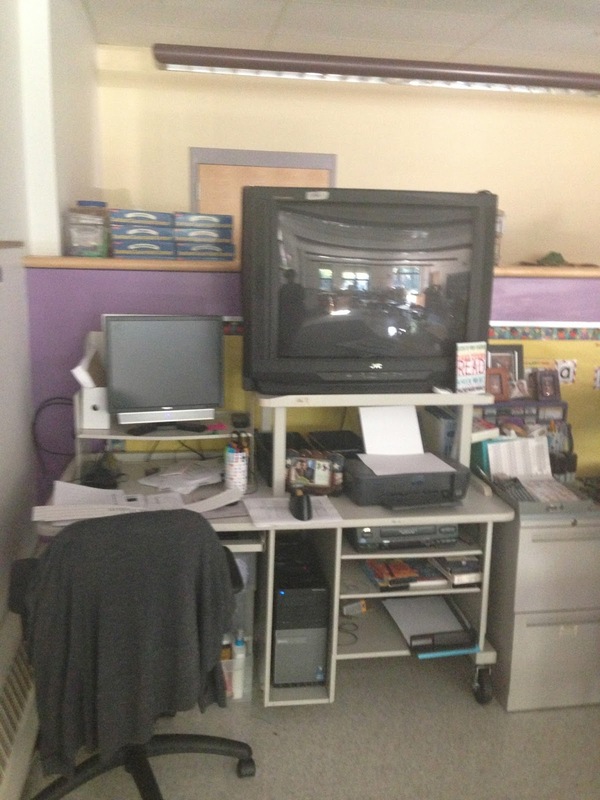 I got rid of my teacher desk last year so I just use the computer/tv desk for my teacher desk. It helps cut down on build up if I have a very small area to work in. 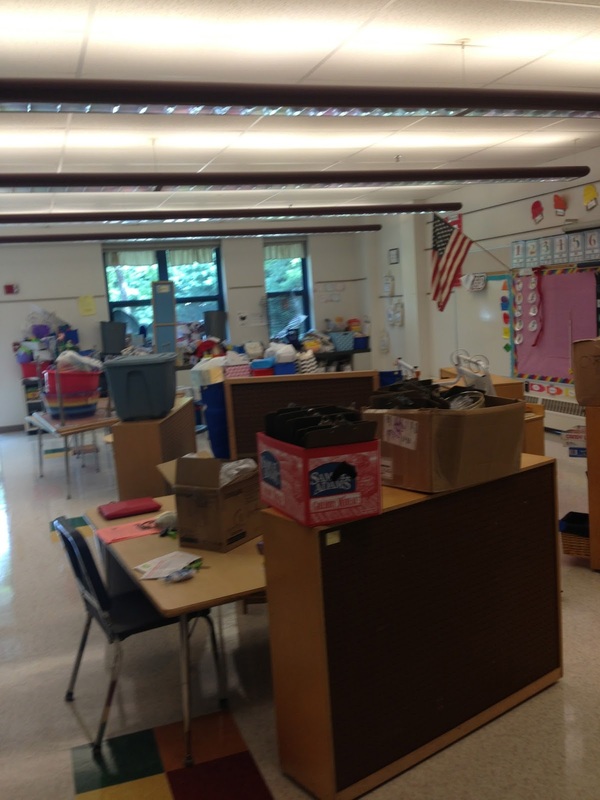 It also helps create more student space. This is my small group area. Right now, I have goodies for the first day sprawled across the top. I know it's super tiny...but I don't like jellybean/kidney tables. I can easily fit 3-4 kiddos here. I might need to change it out for a larger rectangular table but...we will see. This is right next to my area and my small group table. 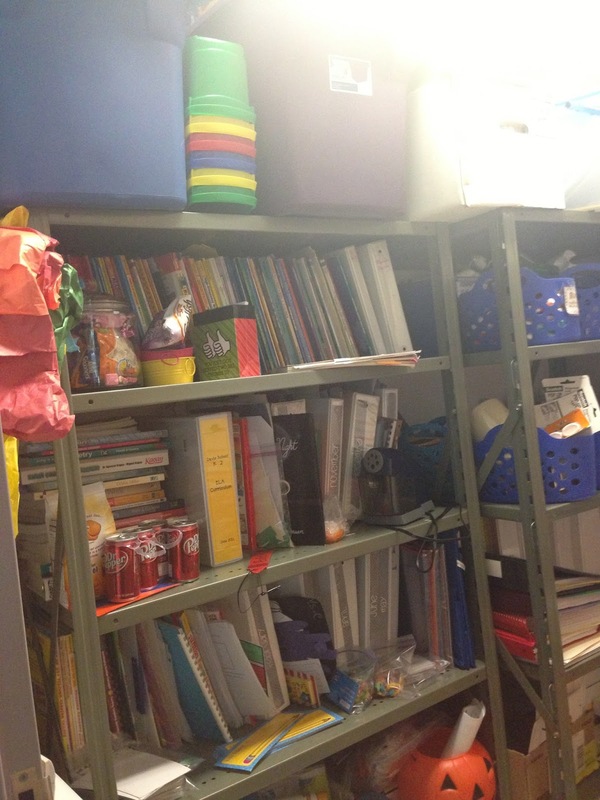 The bins on the right hold my small group binders. I was able to fit 3 in each bin. 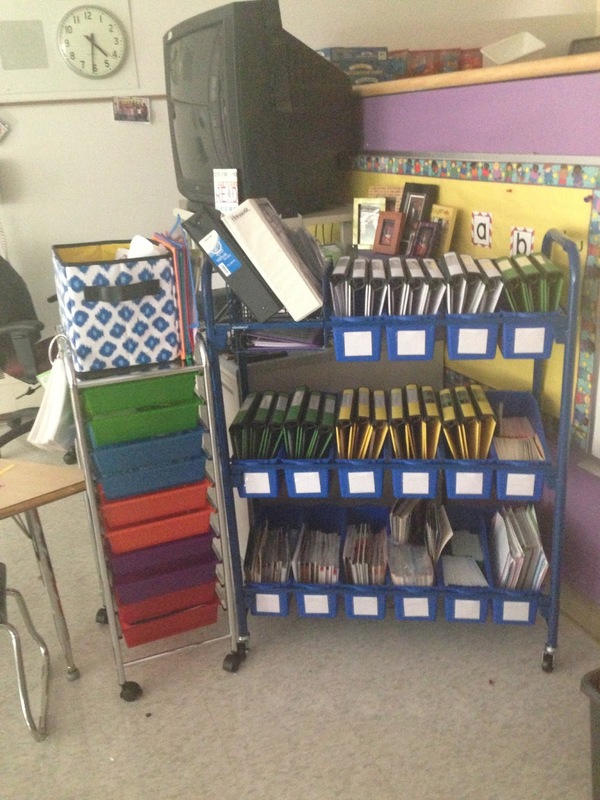 The cart also holds my leveled readers. I need to organize them a little more but I like having everything in one place. The binders hold my RtI paperwork. The rainbow bins on the left hold all the stuff I need for small groups. I was able to fit a few small dry erase boards and markers in a bin. They also are organized by skill. So I have a drawer with rhyming games, another with phoneme segmentation games, and so on. This is my calendar space. Last year I had more space for calendar stuff...but I had to cut it down to this space so I had plenty of room for Fundations. To the left are my classroom jobs. These are a freebie on my TpT site. Click here for your copy. To the right is my Teacher, can I chart. Here is a close up of how I set up my Teacher, can I? signs. I got rid of the Yes/No choice and printed out some thumbs up/down pictures. Now, kiddos will know exactly what their options are! I really like this new change. And...I made sure to add the thumbs up/down option to the download which is free on TpT. Click here to get yourself a copy. 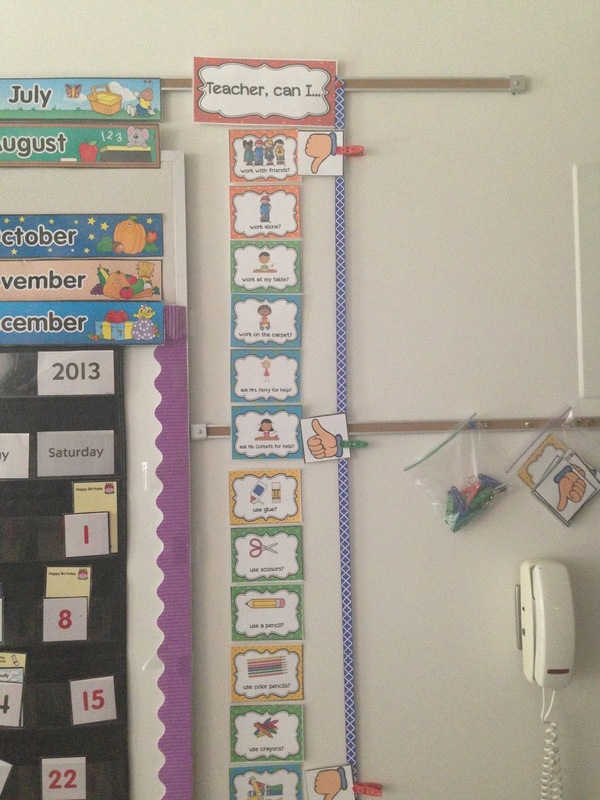 This is my Fundations wall. I had to devote a lot of space to the posters we use in Fundations. 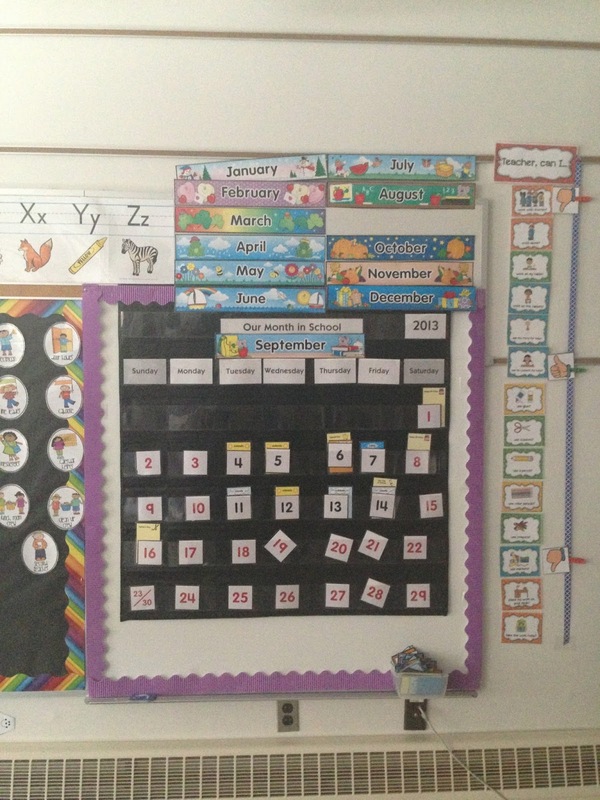 I like the set up because it's in the center of my classroom so the kids have enough space to see each lesson. It's also in a great place so if kiddos need to work on the carpet or in their seats, they can still see everything with ease. 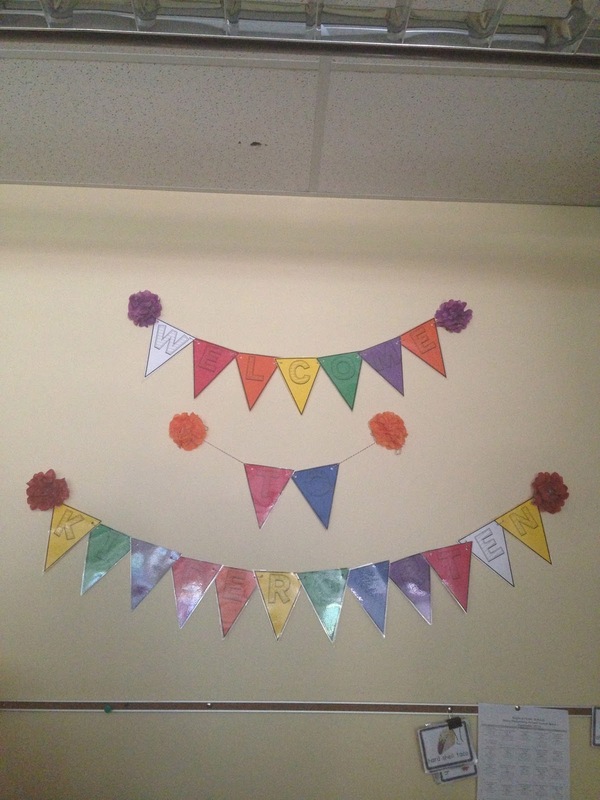 The pennant at the top says, "Fundations". More on those later.. This is going to be my poetry center. The pennant says, "poetry". These are my organization bins for different colored markers, color pencils, or crayons. I'm hoping that when I hear, "I need an orange." Kiddos will head over to these bins and grab what they need. If you'd like a copy of the little crayon color signs, click here. This is my listening center. Last year, I had the signs printed out on larger sized paper...but this year I sized down and just taped the steps on to the table. 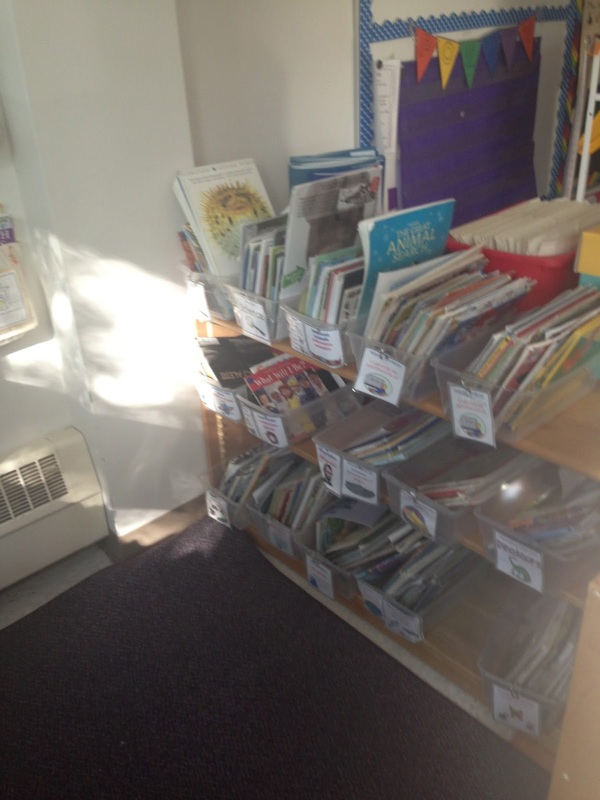 This is my classroom library. The bucket holds tons of pillow choices for the kiddos. They love to lay out and read. 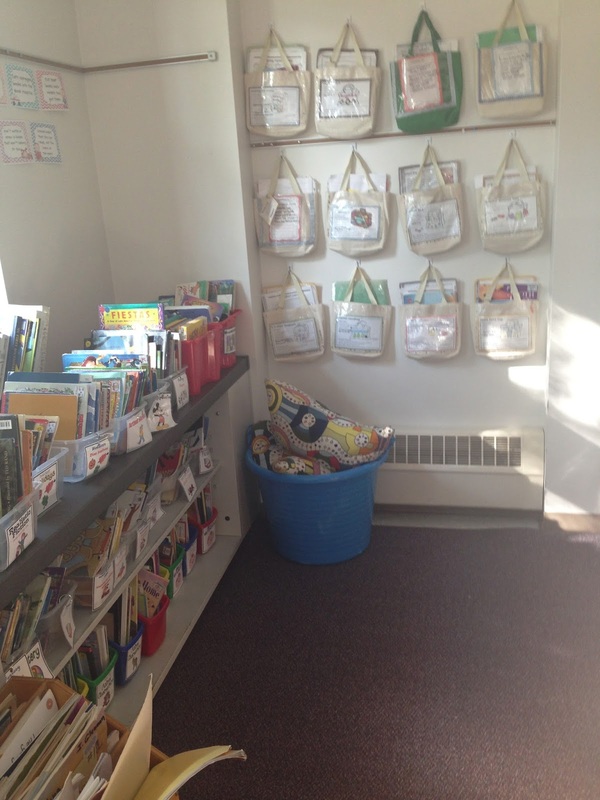 The bags on the wall are take home bags that feature an activity and a book. Kids take home one bag each week. Here's my word wall...I need a little something up at top...It looks a little boring. But I'm sure anchor charts and kids work will fill up that empty space in no time. That was intense!! Lots of pictures...but I'm really excited for my new set up this year. I'm hoping that I'm organized enough to have a smooth year (fingers crossed). I have in my room. Here are a couple of warnings before you download. 1. I made it so that each page could be printed in the ROYGBIV pattern. 2. I had to organize the pages in a different way so the letters are a little mixed up. 3. There are 49 pages of letters. 5. Lastly, unfortunately due to time constraints I can't personalize this freebie. Hey Vera you have been hard at it. You say your room is small but with all the nooks and signs ...it looks huge. Glad to have you back blogging and super excited for you... 99 days and counting. All the best for a great year. I'm your newest follower! I'm also going to be sending you my first SLANT box!! Yay! Ill be emailing you soon with some questions. Fun!